Shout! 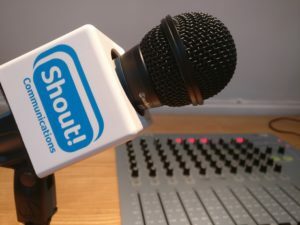 Digital Radio: Listen Again - Shout! Welcome to Shout! Digital Radio. We will be broadcasting for one day only, on Friday 12th April, between 1100-1700. Listen Again will be available immediately afterwards. We have a fantastic programme schedule for you – all sorts of topics to do with Public Relations, with a special interest in broadcast (of course! We are broadcast PR specialists). Research, celebrities, Brexit, radio, TV, video production….we’ve got it covered. We’re delighted that Radio 4 Newsreader and presenter Charles Carroll has agreed to be our continuity announcer. To see a full schedule for the day click here to download the programme schedule. A radio station for the day can be a great addition to a PR campaign. You can target as broad or specific an audience as you wish. Content shouldn’t be too branded – you can get away with it on your own station, but listeners won’t like it and will turn off. Once produced you have great content on the day, plus you can use it all again in its entirety, or in cut down versions – think podcasts, blogs, newspaper articles, clips for Twitter and social…. Or you can call 020 7240 7373.